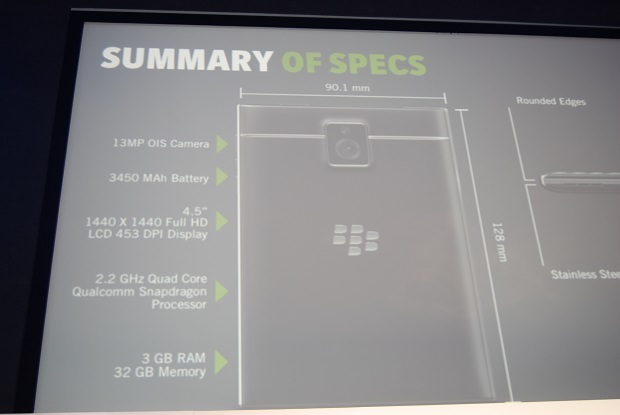 The BlackBerry Passport. (Image: BlackBerry). 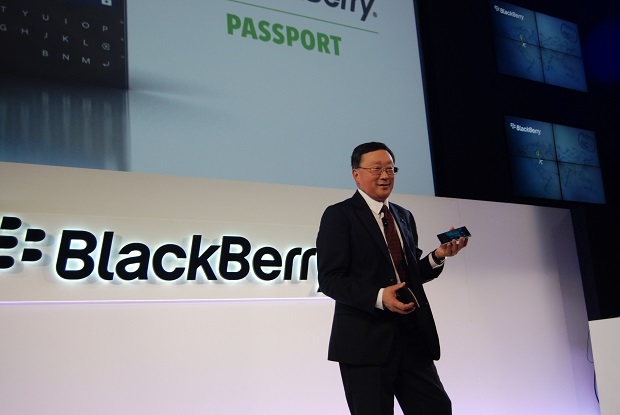 BlackBerry Ltd. unveiled its latest smartphone, the Passport, in three events today in Toronto, London, and Dubai. With a 4.5-inch, square display that sets it apart from most of the other rectangular phones on the market, the Passport is being touted as a device for enterprise users who want a device for both productivity and security. While many of the details surrounding today’s Passport had already been leaked or shared ahead of the event, including mention of the phone’s square shape and its wider screen, BlackBerry revealed full device specs today. The company was quick to draw event attendees’ attention to the Passport’s robust battery life, saying it should last up to 30 hours on a single charge. It also pointed out the ability to be able to read more and see more with the device’s wide screen, and it touted the benefits of BlackBerry’s classic, QWERTY keyboard with physical keys. Aside from technical specs, BlackBerry CEO John Chen took to the stage at the Toronto event to share pricing details, as well as availability. The Passport is available today in Canada exclusively at Telus for $200 on a two-year contract until Oct. 1. After that date, the phone will ship for $250 on a two-year contract, while it sells for $699 outright. The Passport will also be available in 30 other countries by year’s end, selling for $599 in the U.S. without a contract. Beyond trying to appeal to enterprise users rather than consumers, BlackBerry is also trying to reclaim its place as a household name in Canada. 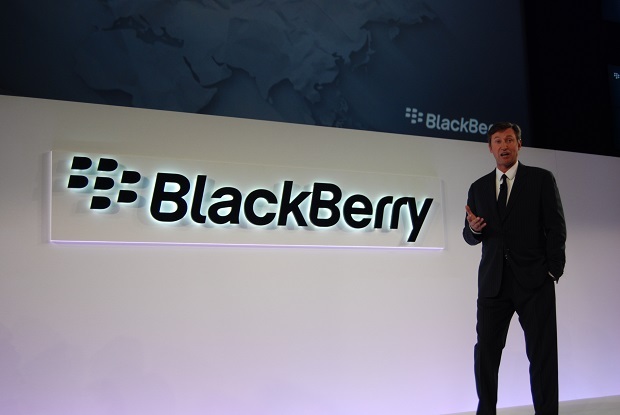 The Waterloo, Ont.-based company brought hockey legend Wayne Gretzky to its announcement today, with Gretzky briefly taking the stage to say he feels BlackBerry is still a strong Canadian brand. 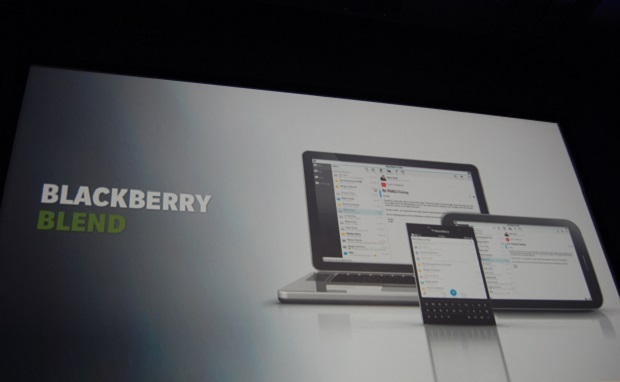 Still, for BlackBerry, it wasn’t all about hardware news today. The company also announced BlackBerry Blend, a new feature that will allow users to access both work and personal data, including emails, calendar, BlackBerry Messenger, text messages, and so on. It also allows users to transfer documents securely between devices. The feature launches today on the BlackBerry Passport, but it is also available in the Apple App Store and Google Play for iPads and Android tablets. The feature will also run on desktop operating systems, including Mac OS X 10.7 and up, as well as Windows 7 and up. 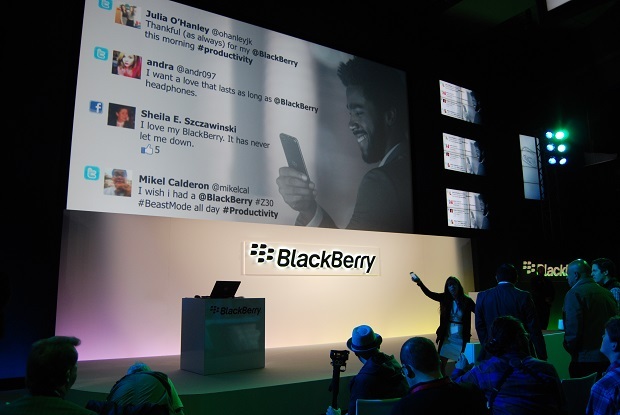 There are still a number of BlackBerry announcements to look forward to before the end of 2014. Chen didn’t delve too deeply into BlackBerry’s business strategy today, and the company has yet to unveil BlackBerry Enterprise Server 12, an important software update that will help determine how much traction BlackBerry has with the enterprise market. Nor did BlackBerry provide any details about the Classic, another smartphone slated to come out before the end of the year. 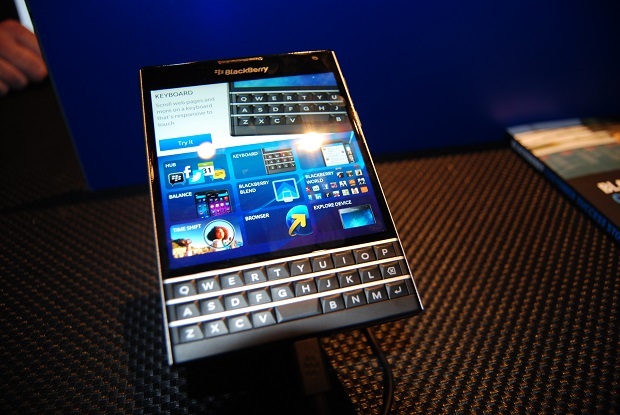 BlackBerry’s second quarter earnings will be released Friday.